1. Introduce yourself, when did you start rapping? My name is Nick form Spit Syndicate, and I got into rapping at a very young age. I used to write raps… well they weren’t so much like raps they were more like rhyming poems. I used to write them for like school assignments and to me it was just an extension of creative writing, which I really liked. I first started listening to hip hop when I was about 12, pretty early on I decided that I wanted to have a crack at this. So I first started free styling, and then battling and then started to try and write songs. So its existed for quite a while in my life. 2. Where did the name Spit Syndicate come from? It’ a very common question that gets asked in interviews, and I really really wish I had a good story for it. But basically myself and Jimmy (the other rapper in Spit Syndicate) we started writing songs and we were trying to do gigs, we were like 17 or 18 at the time, and we got a booked, like our first proper gig, and the promoter was like I need a name for the flyer… This gig was right before my first yr 12 exam, but basically we just needed a name because the promoter was hitting us up and that’s what we picked. Little did we know that it would kind of stick. And once you pick a name you’re kind of locked in. People seem to like it though, they’re always like, that’s a really cool name. But to me, I could probably go back and choose something different to be honest with you. You can’t get it confused with too many other names but I tell you what, it gets misspelled everywhere! Happens all the time, but its all good. What’s in a name? 3. Who are some of your influences/ who inspires you? Well the first hip hop I heard was from America. So it was Biggy and 2Pac and NAS and J-Z. That was the time I had just started high school, and I was at an age where I was so impressionable and I looked up to those people and still do. So that’s the first hip hop I heard, mainly stuff from New York. When I heard Australian Hip Hop it was in the form of Hilltop Hoods, Coolism and people like that. That’s how a lot of people that are into Aussie hip hop started out getting a taste for it. First listening to American artists then hearing this Australian stuff cause they could just relate to it and their circumstances a lot more than the American stuff. 4. How do you feel Aussie hip hop is going in a global sense? I think that the standard of hip hop in the country in the past five to ten years has increased so much and has come so far. The way it sounds, you know, the way the music is getting treated and mixed and mastered, the bar has been raised. I think there has been many releases in the past 10 years that are world class. 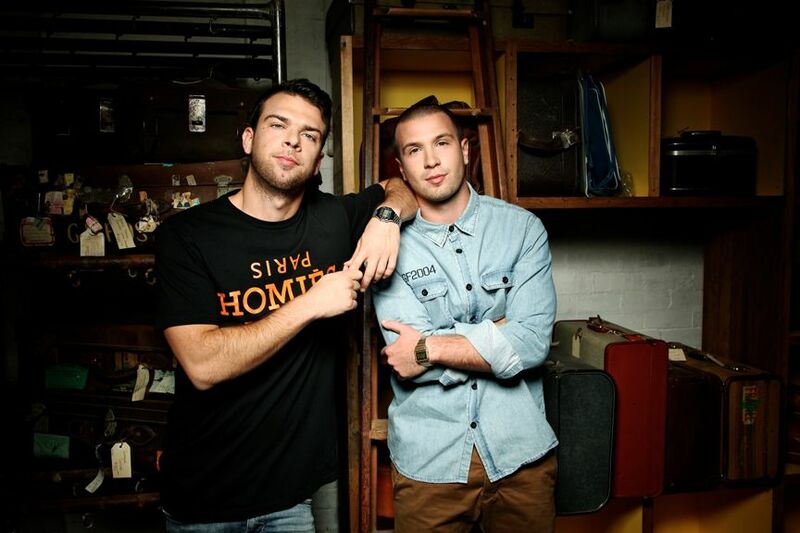 Australian hip hop seems to be finding an audience in pockets of the world. In America, I don’t know Aussie hip hop will become anything bigger than underground because Americans have a really strong existing hip hop culture, and really, Americans like listening to Americans. But I know people are listening to it in places like Europe and Canada, and we’ve had people from New Zealand and Asia hit us up as well so I think that more and more, you will be seeing Australian hip hop groups organise tours and tap into the overseas audiences. Part of the charm for us as Australians is that aussie hip hop speaks to us, its localised, and relatable, and you’re familiar with the stories. But that doesn’t mean that people from other parts of the world can’t get into it. I think that as long as acts and artists keep making world class music, it will be received by the world. 5. You guys are on your National Tour at the moment, how has that been going. Has anything crazy happened so far? Well we just arrived in Adelaide, and we were on the same flight as Pharoahe Monch! He’s playing at the same time we are, which is disappointing you know, we want to be at his gig! But it was cool being on the same flight and chilling with his crew they’re goo dudes. Yeah its cool with Pharoahe because he’s so far removed from that ego that other American rapper front. But, this tour, it’s the five of us from Spit Sindicate and Jackie Onassis. It’s like being on holiday with four of your best mates. It’s been a lot of fun! We’ve been seeing the songs from our album recreated live and seeing the way that people are reacting to them. It’s a really special feeling you know, we’ve been working on these tracks for 2 plus years so it’s awesome to finally get it out. And when you play it live that’s when you really feel peoples reaction and their connection to the song. Probably coffee shop and sip it slow. Yeah they’re probably 2 of my favourite tracks, but its hard to pick a favourite. 7. The album features a lot of collaborations, how do you think the album has benefited from featuring so many different artists? We certainly felt that it was long over due. The people who we collaborated with on the album outside of those people who are in our crew, are our friends, they’ve been our mates in the hip hop scene for years and we should be making songs with these people! They’re not only our friends but artists we look up to. We were so glad we could work with Illy and finally release a track with Draft. And, working with other artists helps to catch a wider audiences eyes, people who may not be as familiar with Spit Syndicate . And also, working with these artists, even though we’re friends, you really have to bring you’re A game! It makes you lift you standard, you know, to hold your own. And on a track with Draft you really have to bring it. So it’s benefited the album in many ways. 8. Who would you love to work with in future? Jimbah, an MC and singer from Adelaide who’s incredible! And the Thundamentals. Even though they live around the corner from us, we still haven’t got around to laying a track with them, so I’d really love to do that. Also we want to work with some non-hip hop artists as well, vocalists and producers. We’re always looking to collaborate because it’s a really fun part of producing music. But yeah, were really excited about playing the show coming in Darwin with Jackie Onassis, and your local Darwin boy, Requiem. So feel free to come and support your local and interstate talent. 10. You’re coming to Darwin on May 2nd. Have you been here before? No, but we’re really excited. And it’s a place I’ve always really wanted to visit. My dad worked there for 20 years, my sister lived there. We’ve actually done something we don’t normally get to do and we’ve allowed ourselves a little time in Darwin before and after the show just to drive around check the place out! Firstly, why are you dressing like that? Secondly, why are you eating so much crap? – You’ll get fat. Thirdly, be more respectful of others and yourself and other people’s property, and don’t worry too much, you’re going to be ok.
12. What advice would you give to any young rappers trying to make it in the Aussie hip-hop scene at the moment? Well trying to ‘make it’ in music I think you have to be kind of careful about how to define ‘making it’ because sometimes trying to put your music out there and get music off the ground can be incredible frustrating and it feels like you’re banging your head against a wall. Its very easy to forget why you’re doing it. Ultimately the reason you should be doing it is that it makes you feel good, because you want to express yourself, because you want to tell your and other peoples stories. I think that you now your reasons for wanting to make music should come from the heart. If you want to try and make lots of money, you should get a law degree or become an accountant or do something like that. Also just practice and hone your craft. The down side of the internet and music technology is that people keep putting out music before its ready, you know they’re not refining their art before putting it out there. There’s no rush you know, you should really work on something and get it as good as you can get it before putting it out there. NTs Biggest Youth Festival wants YOU. 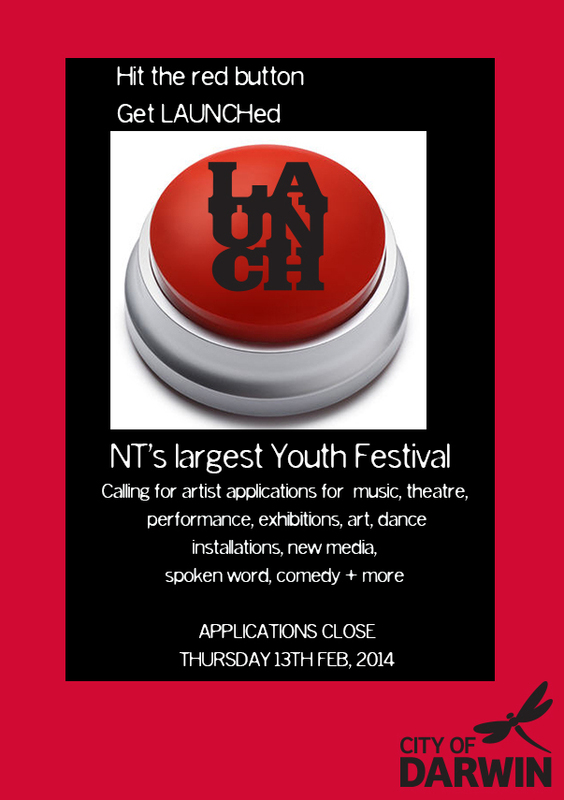 LAUNCH @ Youth Week, the NTs biggest Youth Festival, is coming up and we want YOU. Calling all makers and lovers of music, theatre, performance art, exhibitions, visual art, dance, installations, new media, spoken word, comedy and more- sign up today to get LAUNCHed! LAUNCH @ National Youth Week is a program of arts, cultural and recreational activities for young people. It showcases the talent and interests of young people in Darwin and aims to provide genuine opportunities for young people to develop and present their ideas through a variety of different activities and forums. LAUNCH will see the Brown’s Mart and Happy Yess art precinct utilised from the Wednesday 9 – Friday 11th of April 2014, in celebration of National Youth Week. 1. Did you know that the first couple to be portrayed in bed together on TV were Fred & Willma Flinstone? 2. Did you know that more Monopoly Money is Printed every year than the U.S. Treasury? 3. Did you know that more people die of falling coconuts than shark attacks every year? 4. Did you know that the first character to fart in a Disney movie was Pumba from the Lion King? 5. Did you know that the lion in the MGM studios add before your movie killed its trainer and two assistants the day after it was filmed? 6. Did you know that four is the only number with the same amount of letters as its actual value? 7. Did you know that the weight of all the termites on earth is larger then the weight of all humans? 8. Did you know that people say Bless you when you sneeze because when you sneeze, your heart stops for a mili-second? 9. Did you know that it is impossible to lick your elbow? 10. Did you know that over 75% of people who read this will try to lick their elbow? 11. Did you know that every human spent about half an hour as a single cell? 12. Did you know that a tiny amount of liquor on a scorpion will make it instantly go mad and sting itself to death?